Welcome to part two of my mini-series covering the Assassin's Creed franchise, but mostly its recently released sequel Assassin's Creed II. Once again my good friend Joseph from PALGN is joining me, and in this particular exchange we discuss our initial thoughts about the game. We are both about halfway through and already the game has presented a wide range of topics to think about. Some of those are discussed below, but there are many more in my head. We've got a couple more exchanges after this one, but after that don't be surprised to see even more Assassin's Creed II coverage here. There just seems to be something about it that has put my mind into overdrive. Anyway, onto the good stuff. Steven: So Joseph, I have spent a few nights with Assassin’s Creed II, as I’m sure you have as well, so I figured it was time to discuss some of our initial thoughts and impressions of it. To change things up, I’ll go first this time. The first thing I noticed with Assassin’s Creed II, when comparing it to the original game, is the difference in how Ubisoft have approached Ezio’s story when compared to that of Altair’s; effort has been put in to ensure that Ezio’s story is more involving and, arguably, the end result is a story that’s more compelling than Altair’s. As we discussed in our first exchange, I felt like Altair was a conduit at times for the main gameplay, with the narrative enjoyment coming from Desmond’s side of things instead. 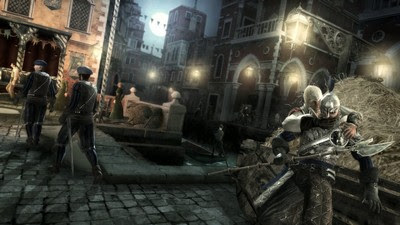 It is different here and I actually find myself interested in Ezio’s story. Part of that, I think, is how the story is introduced: the tutorials don’t just serve as explanations for the game’s mechanics; they also introduce you to Ezio’s family. More importantly, they allow you to interact with his family – from racing his brother to helping his mum as she visits a friend – and it is this short time that draws you into the overall narrative. Sure, bells and whistles aside it’s just a prelude to the main thing, but unlike the original Assassin’s Creed it does a better job of immersing you within the game, and that’s impressive. It’s not perfect, however; these tutorial or ‘ease the player in’ missions as a whole take far too long and there are too many of them. Maybe it’s just me, but there is something wrong when 3 hours into the game, I am still being taught how to play the game or how to use a newly acquired item or skill. Sure, they’re designed to ease you into the narrative as well as new players into the mechanics, but then again, they’re not; I think it is the third mission that sees you racing against your brother, the endpoint being a marker that’s on a rooftop not far from where you begin. Despite having experience from the first game, I actually had to retry this mission because I was still getting (re)accustomed to the controls, as well as getting my bearings. The game, in my view, assumed I had played the first one and expected me to be more efficient with my skills as a result. I’ve noticed other, minor examples of this throughout so if I’m right and assumptions are being made, then that is in direct conflict with the amount of tutorial missions there are and the length they go for. Just something I observed and thought was odd. I don’t want to discuss the characters or the narrative too much, as I’d like to play more of the game for one and I think it’s deserving of its own exchange for two, so let me change pace and mention the structure of the game as well as the design of the cities. Another thing I noticed instantly was how easy it was to get my bearings. 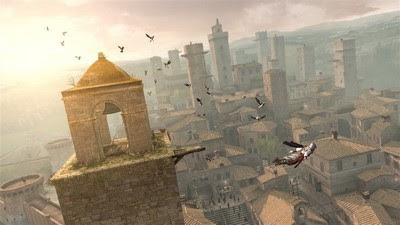 Maybe it’s a credit to the early mission design, maybe not, but so far it seems like the game’s cities (I’ll pause there to mention that I’ve only seen three so far: Florence, Monteriggioni and Tuscany) are designed a lot more fluidly than the ones in the original Assassin’s Creed, with more landmarks and distinctive buildings than before. It makes navigation down in the streets a lot easier which is nice because it’s not always feasible to be traveling across the rooftops. The immersion of these cities is as good as it was in Assassin’s Creed, if not better, with an atmosphere that makes them feel as if they are occupied with living, breathing people. It just exudes a sense of active, yet relaxed activity that makes them feel populated without being cramped, making it a joy to just walk around in but irrelevant when it comes to the proper meat of the game: the various missions and objectives. There’s a lot more variety here, all of it breaking up the pace by changing things up and distracting you, and that’s a marked improvement over the repetition seen in the original. Throw in the emergent pace enacted by the player – the ability to do whatever, whenever -- and it keeps things fresh without being overwhelming. With all that said and done, however, I do get the feeling that it is perhaps a bit conservative. While I still enjoy climbing up to another viewpoint or racing across the rooftops in an allocated time, I do wonder if that style of play is going to get stale if it continues in future installments. Even the new additions such as the underground tombs aren’t as compelling as I feel like they could be. I mean, at the end of the day, all you’re doing is exactly what you can do outside: jump, climb, and run from one location to the next, usually because of a desired goal. To me, there’s not much difference between the hunt for another sarcophagus and an attempt to reach another viewpoint; one is inside, directed and a bit more passive, while the other can be approached from any angle but ultimately there is only one, maybe two ways to reach the top. Don’t get me wrong, as it is now it is enjoyable and I’m glad Ubisoft added these tombs – admittedly, I’ve only seen a handful – but if it continues in future installments then I’m not sure whether it is something I will continue to enjoy, that’s all. It just feels like what we’ve gotten is iteration on what came before – a good thing – wrapped up in a better structure that doesn’t get repetitive. Iteration is welcome, but so is innovation, and that is something I’d like to see alongside the main stuff in the inevitable sequel. I have much more I could say about this game and it’s still only early days, but I’ll stop it there to allow you to respond and offer your own thoughts about your time with the game so far. So how are you finding it? I think it’s safe to say it’s an improvement upon the original game, but how much of one, do you think? Take it away. Joseph: Hi Steven. Much like you said in our previous exchange, I too seem to be noticing and liking the same things you are. After watching some trailers for the game I immediately knew Ezio’s story would be much stronger than Altair’s. I like how the game opens up showing him as a cocky, obnoxious teenager who gets into fights and what not. But, you also get a sense of just how much pride he takes in his family – escorting his mother to the shops, looking out for his kid brother and sister, and of course the level of respect he displays for his father and older brother. I thought it made the tutorials a little more interesting as it introduced you to Ezio’s family and gave you a little more insight to their relationships, but as you said it did feel a little slow to start off with. In fact I felt the game didn’t truly pick up until Ezio had met up with his uncle, of course that isn’t to say the game was boring up until that point. Again, I am simply enjoying walking around the environments and exploring my surroundings. The various streets and suburbs are definitely more recognisable this time around, arguably due to the inclusion of landmarks and other unique structures. If we look back at the original Assassin’s Creed, while the cities were huge and had distinguishable areas (rich/moderate/poor districts), you could easily get lost walking in the streets as everything looked the same. Churches were the same height and width, housing was identical on nearly every corner, and evening gathering spots looked like they had been recycled. In Assassin’s Creed II however, I’m seeing these marketplaces, prisons, unique housing structures such as apartments and villas, and churches that have distinguishable towers and courtyards. Ubisoft has clearly put a lot of effort into designing levels, and the result is an even more engaging experience than the original. A few other things I’m enjoying at the moment are the economy and notoriety systems. When Ubisoft first announced these would be a component of the gameplay I was skeptical if it would suit the game’s atmosphere and setting, well, more so the economy system than the notoriety system. The economy system is a relatively minor feature actually. I mean, you’re rewarded money for completing missions, so it’s not like you have to do any mundane tasks such as chopping wood or bar tending (ala Fable II). But, I like how there’s a small emphasis on being careful how you spend your money. At the top of my head you have to restock throwing knives and poisons, as well as repair your armour, make regular trips to the doctor to heal yourself, and hire henchmen to do your bidding (I’ll touch on this a bit more later). Various armour and weapon upgrades become available later in the game, so by the time you spend your money doing the former, you won’t be able to purchase that stronger sword from the blacksmith. Or if you wanted to do it the other way around, you might not have sufficient funds to heal Ezio if you bought a new weapon. It’s not necessarily innovative to the industry, but it adds that extra element to what was already established in the original. As for the notoriety system, again it’s just a step up from the original and makes things feel a little more realistic. 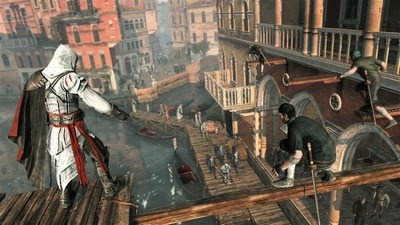 If Ezio committed crimes in a real-world city, chances are people would be on the look out for him. He wouldn’t be able to stay hidden for a few minutes then duck out I broad day light all fine and content with being in public view. I must admit though, I probably like the feature as it’s reminiscent of the Hitman series, only more refined. I made a quick mention before about hiring henchmen (courtesans, thieves and mercenaries). Again, it’s something that isn’t new to the industry but adds to the Assassin’s Creed experience. I must admit, I have a bit of a soft spot for hiring the courtesans. 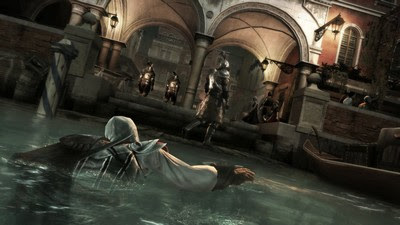 The way they flirt with the guards, how crowds whistle and cheer as they walk by, and how Ezio is standing in the centre of the group like a pimp spending a night out on the town; it’s just plain good fun. 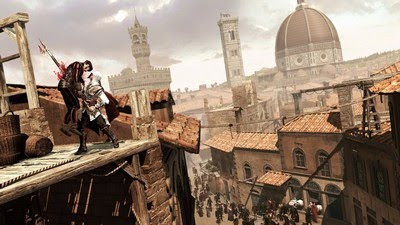 Of course, when I’m scaling the rooftops the thieves are my companions of choice, although I have noticed they tend to be a little less mobile than Ezio and can sometimes end up a fair distance away from you -- certainly not good when you’re taking on enemy watchmen. The mercenaries are my least favourite. I don’t know why exactly, but it’s probably because they lack the style of the other two. That said, they do manage to help me out in sword fights by distracting guards long enough for me to creep up behind them and deliver a fatal blow to the neck. CLING! Got to love that sound effect. As for your little comments about the tombs, if anything I think there aren’t enough of them. I can see what you’re trying to get at, but I actually like how Ubisoft has focused the gameplay mechanics in an enclosed environment. The tombs make the game feel a lot like a platformer, and I’m not too sure which ones you’ve explored, but quite often you have to race against a timer. An example is flicking a switch which causes doors to open, and your aim is to race through a specific route before they close. In the ones I’ve explored so far I’ve actually had to stop for a bit and think how I’m going approach the challenge. Some sections are definitely head-scratchers while others are a walk in the park, but it adds variety and is a compelling part of the game. Going by the achievement list though, it seems there are only six different tombs to explore, so hopefully the recently announced DLC will include a few more locations. To simplify everything I’ve said, from what I’ve seen so far I am liking the minor additions to gameplay and how Ubisoft has refined some elements from the original Assassin’s Creed. I’m particularly looking forward to how the story progresses as it’s interesting watching Ezio grow from a cocky kid into a mature adult. It’s certainly an inspiring tale of manhood and revenge, which is something I’d like to touch on further in a future exchange. I hope you enjoyed our initial thoughts about Assassin's Creed II. In our next exchange, we will be discussing the weapons and enemies found in the game, as well as how the game implements its collectibles and the intriguing addition of Subject 16's strange videos. In the meantime, feel free to read part one of our exchange which discusses the original Assassin's Creed, and as always feel free to engage the discussion -- the more the merrier, as they say.